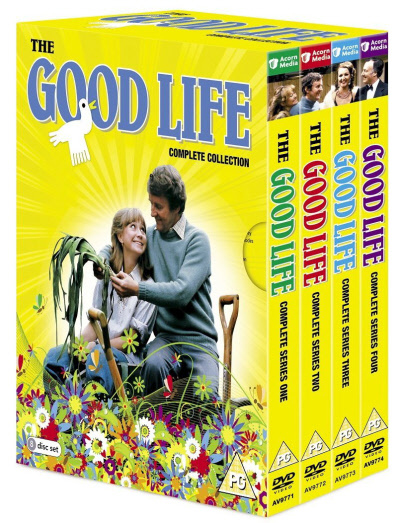 The BBC’s classic 70s sitcom The Good Life is essential viewing for anyone interested in British comedy. Mocking middle-class complacency and alternative lifestyles at once, it concentrates on Tom and Barbara Good’s efforts at self-sufficiency in their suburban garden, and the horror of their neighbours, hen-pecked Jerry and snooty wife Margot. The show has since been released as a complete DVD box set available now. Let’s take a look at some funny lines from the program. Jerry: I see the asylum haven’t sent the van yet! Margo: Did I hear a dinner gong? Tom: Not unless the chicken jumped out of the oven and banged one. Tom: Hello, girls. Had a good gossip? Barbara: No, we’ve been playing strip poker with the postman. Tom: I’m stronger that you are and I can pin you to the bed any time I feel like it. [Barbara is visiting Tom in jail] Barbara: Oh, Tom. I do miss you. Tom: I miss you too, love. There’s two-thousand of us in here but it’s ever so lonely. Jerry: Look, I’ve just cut my finger clipping your blasted hedge. Margo: Don’t swear, Jerry. And don’t bleed in the sink, I’ve just cleaned it. Margo: [reading from a card]: The Ooh-Aah bird is so-called because it lays square eggs. I don’t understand that. Jerry: Brick by brick, she’s building a madhouse! Barbara: I suppose we must be rather a blot on the avenue’s escutcheon. Margo: I have risen like a phoenix from the fires of your eccentricities…Nothing you can do now will shock me. Tom: When’s the boar-walker coming, Barbara? Conservative Jerry and his social climbing wife Margo, played by Penelope Keith and Paul Eddingon, who live next door, look on appalled. Self-sufficiency brings Tom and Barbara numerous challenges, from a reliably unreliable methane-fuelled car to their attempts to dye wool using nettles, to the problems of killing their chickens. Barbara balances her husband’s mad schemes with her pragmatism. Jerry’s derision of Tom eventually becomes a grudging respect, and even the monstrously snobbish Margot is a thoroughly human, three-dimensional character. In its kindly, light-hearted way, The Good Life shows how difficult it can be to be different to those surrounding you, and how much courage it takes. A genuine classic, it was named our 9th favourite laugh in the Britain’s Greatest Sitcom poll.